I checked this out on Overdrive almost immediately after finishing "If I Stay." Somewhat surprisingly, I enjoyed this sequel to even more than the original. The novel picks up about three and a half years after the car crash and subsequent events in "If I Stay," and is told from Adam's point of view, which I wasn't expecting. Adam is now a rock star with Shooting Star, his same band that was on the verge of breaking out in "If I Stay." But the group's dynamics have completely shifted from the close-knit, supportive group we glimpsed in "If I Stay." Isolated and shut out from the group, hunted by paparazzi hoping to get a shot of him and his movie star girlfriend, it's no wonder Adam is on the verge of a breakdown, even as Shooting Star is currently the biggest act in music. Adam is dreading the start of a 67-day tour with his band, to whom he no longer speakers, nor even stays in the same hotel. As he checks off his to-do list in New York City before the show starts, he encounters something that makes him recall Mia. He now has new plans for how he will spend his dwindling time before the tour starts. I don't want to say more on the plot, to avoid spoilers for both this and "If I Stay." Forman uses the same narrative structure that I found so intriguing in "If I Stay." She sets the story in just a brief day or two, but tells the tale of all that came before through flashbacks, grouped thematically, rather than chronologically. She packs big emotional punches through those flashbacks, both happy and sad. The story and the structure still feel fresh, and this title was every bit as engaging in the first, without the coma-ghost weirdness lurking around. Verdict: Affirmed, though you'll need to read "If I Stay" to fully grasp this sequel. 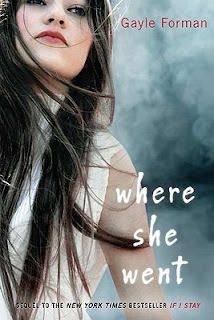 "Where She Went" by Gayle Forman, published on April 5, 2011 by Dutton Juvenile. Audio narration by Dan Bittner, published on April 5, 2011 by Penguin Audio.